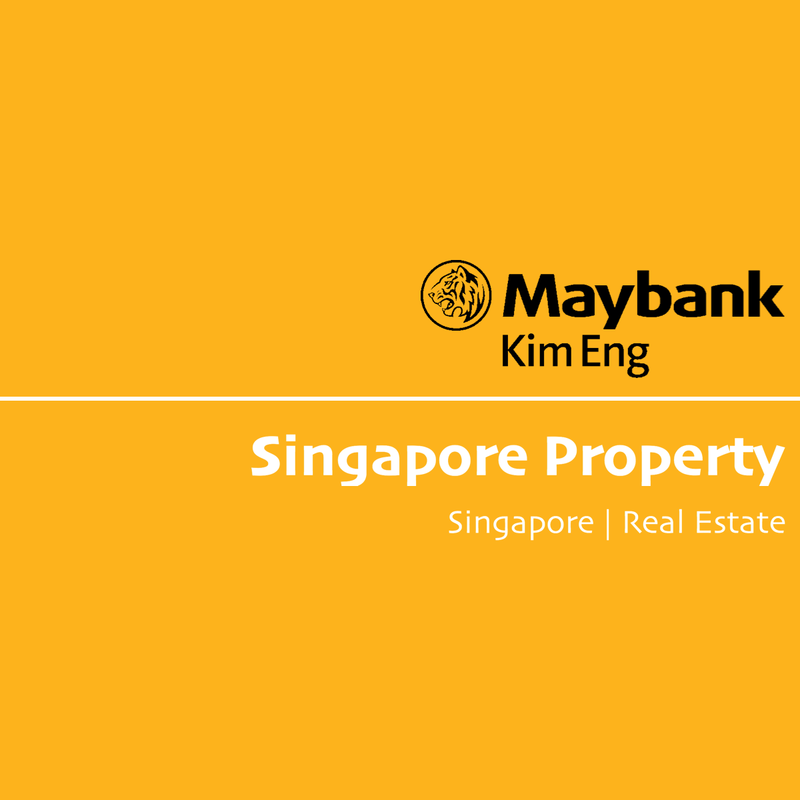 Maintain POSITIVE sector view on Singapore property developers. Fresh data points continue to validate our call for a property price rebound. Significant premiums achieved at new launches suggest initial estimates can be sustained, calling for a strong 3.1% q-o-q rise on the 1Q18 URA PPI. Consultants recently raised their forecasts and now see home prices rising by 7-15% this year. Developers can capitalize on the strengthening market by acquiring 15 residential sites currently up for tender. With significant exposure to Singapore’s residential market, Bukit Sembawang and CityDev are the biggest beneficiaries of this trend. New launches this year have achieved significant premiums over comparable projects launched in recent years. The price rebound appears to be broad-based with strong performance across all market segments. In the high-end market, New Futura was launched on 18th Jan at SGD3,200 psf or a 23% premium over the launch price for Gramercy Park in Jun 2016. In the mass market, The Tapestry achieved SGD1,310 psf at its launch on 24th March. This was a similar 23% increase over The Alps, an adjacent project launched in Oct 2016. Just over the weekend, the second phase of mid-range project Park Place Residences was launched 11% higher than its initial phase last year. Strong prices seen at these new launches have reinforced our view of a recovering housing market. Using housing transactions up to mid-March, URA’s initial estimates are for private home prices (URA PPI) to rise by 3.1% q-o-q in 1Q18. With strong prices achieved at launches since mid-March, we expect this positive trend to be sustained. A recent poll by The Business Times showed property consultants have raised their forecasts and now expect the index to rise by 7-15% (previous: 3-8%). Higher frequency data from SRX also points to a healthy rebound. 15 residential sites up for tender today could add 4.9k units (1.4k GLS, 3.5k private) to the pipeline for developers. These deals represent significant revenue opportunities that developers can pursue to capitalize on the market rebound. 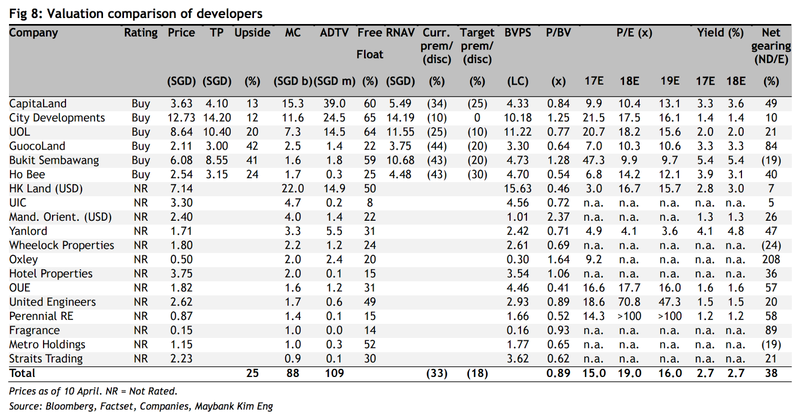 Most developers in Singapore have a net gearing of less than 1.0x, which implies significant balance-sheet capacity to pursue these growth opportunities. While the impending demolition of enbloc sites will lead to a small supply of private homes in 2018-19E, a word of caution has to be said about a supply build-up in 2021E. As developers are not allowed to landbank under the current regime, most projects are likely to be completed within 3-5 years of land acquisition. With enbloc deals since 2017 potentially adding 20k units in their new properties, we see private housing supply rising to over 17k units in 2021E. As such, we believe the market could focus on potential weakness from late-2020.